5 Centimeters per Second is an adaptation of the Makoto Shinkai film of the same name. Shinkai is well-known for his various film works which feature highly detailed animation and background work; some notable pieces in his filmography include Voices of a Distant Star, Children Who Chase Lost Voices, and The Garden of Words. The 5 Centimeters manga was illustrated by Yukiko Seike, whose other works include Majime na Jikan (A Serious Time) and Tsuki ni Hoeran nee? (Why Not Howl at the Moon? 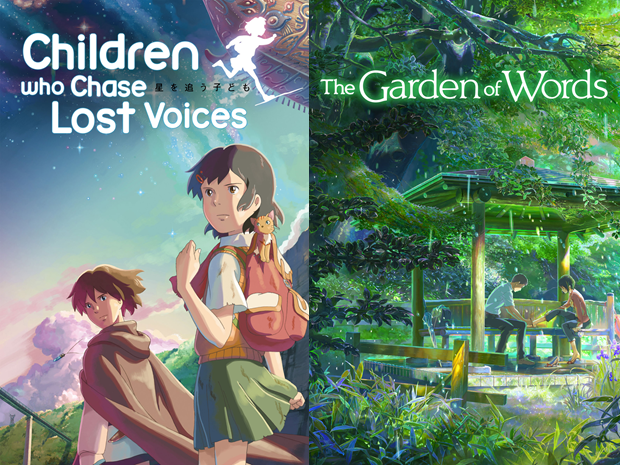 ), neither of which have official English releases. 5 Centimeters per Second focuses on various events occurring in the life of Takaki Tohno. 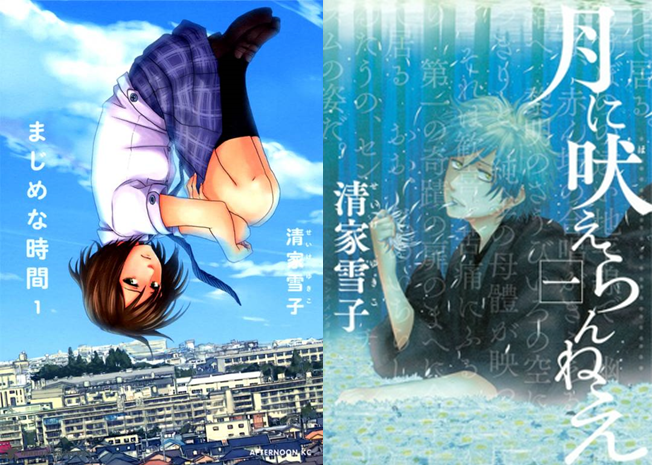 The manga starts in Takaki’s elementary school years, when a girl named Akari Shinohara transfers into his class. The two bond quickly over their love of fantasy books as well as their enjoyment watching the sakura tree petals fall and scatter. Unfortunately, after their elementary school graduation, Akari’s family moves to a different prefecture, leaving Takai behind. Throughout their middle school years, Takaki and Akari exchange letters to one another in order to stay in contact, eventually culminating in Takaki taking a lengthy overnight trip to meet with Akari in person before his family moves. The two confess their love for each other under the sakura trees, and Akari wishes Takaki well for the future. The story transitions into Takaki’s high school years, where he laments that he and Akari have grown even more distant from one another, and ultimately stopped sending each other letters. 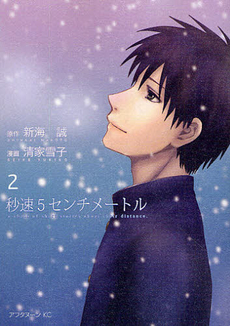 During this time, the story shifts focus to Takaki’s classmate Kanae Sumida. Kanae is a hobbyist surfer who considers herself to be a below-average student. She also has a major crush on Takaki, having fallen for him at first sight when he transferred into her middle school. However, Kanae is unsure of what Takaki truly thinks of her, as he seems to act unfocused and distant whenever the two are together. The final act of the manga follows Takaki’s adult years, wherein he works as a salary man. Takaki is ultimately dissatisfied with his career, and makes the decision to quit. During the same period, Takaki manages to secure a three-year relationship with a woman named Risa Mizuno. However, their relationship quickly starts to crumble, as Risa grows impatient and frustrated with Takaki’s spaced-out attitude. On the flip side of things, Kanae has found some success working as a nurse and catches the eye of a fellow surfer friend who wishes to date her. However, Kanae still feels at loose ends with Takaki and feels the need to resolve these feelings. 5 Centimeters per Second tries its damndest to be a bittersweet romantic drama hinged in nostalgia and fleeting friendships, but comes off more as an underwhelming, tepid story with a dash of melodrama. The characters, in particular, are probably the most frustrating aspects of the story, which in turn makes the entire story a dreadful slog struggling to be a heart wrenching story. Takaki gets hit with this sentiment especially hard: the degree to which he allows his brief romance with Akari to affect his personality well into his teenage and adulthood years makes him come off more as dickish and uncaring, rather than genuinely troubled. He acts in a manner that would make it seem as though Akari was murdered in front of him and he was scarred for life. In general, the manga tries to paint Takaki as a sympathetic character, but he comes off as so cold and unaware of himself and his actions that it is hard to be very sympathetic. Other characters in 5 Centimeters also come off as poorly written. Akari in general is treated more as an enigma in which the story vaguely revolves around, a sort of “trophy the main character couldn’t get in the end”, rather than an actual character. Risa ends up as a sort of living “pity-party” character who seems to be made for the primary purpose of having the audience sympathize with her because of how Takaki treats her. Unfortunately, Risa barely has any other major personality traits to speak of as a result. Kanae seems to be one of the better written characters in the entire manga, as the story gives focus to both her struggles with her frustrating feelings for Takaki, and her feelings of mediocrity towards herself. However, Kanae still suffers from her over-attachments to school romances that Takaki himself also has. Overall, 5 Centimeters falls apart largely because of the flimsy writing and characterization of its cast. The 5 Centimeters manga does have a significant upside in its artwork (though it is not significant enough to compensate for the awful characterization). Yukiko Seike seems to have taken great care to replicate Makoto Shinkai’s love of hyper-detailed backdrops and scenery into manga form. Her level of detail can be seen all over the manga, from the shrine young Takaki and Akari visit briefly during their elementary school years, to the quiet, isolated bullet train car taken by Takaki during middle school, to the bustling, crowded Tokyo streets traversed by Kanae. The background work is offset by Seike’s rather simplistic designs for characters. Takaki and Akari have rather straightforward designs that make them easily identifiable as they age throughout the story. Risa is noticeably distinguished by her glasses, while Kanae has a short haircut that she maintains well into adulthood. Despite the rather simplistic designs, Seike manages to keep the main cast identifiable yet unique in their own ways. Pros: Beautiful artwork that emulates Shinkai’s love of detailed scenery and backdrops. Story is pretty linear and easy to read in one huge burst. Cons: Characters are horribly written, with many lacking any personality or, in the case of the protagonist, being difficult to sympathize with. The awful characters end up making the story a drag as a result. The abrupt ending feels like a cop-out rather than leaving matters up to the audience’s imagination. 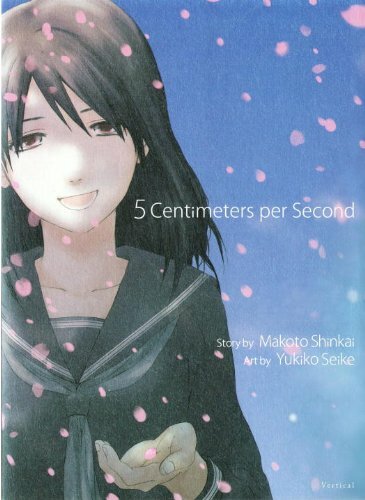 The 5 Centimeters per Second manga is published in the U.S. by Vertical Inc. Ultimately, I found 5 Centimeters to be an underwhelming and somewhat frustrating experienced wrapped in a pretty package. I’m also not sure if my general displeasure with the manga is due to some cultural aspect that is lost on me, or if I am too jaded for the story to have its intended impact on me. The characters are the foundation of the story’s focus, and the entire facade falls apart as a result. At the end of the day, I would say 5 Centimeters per Second is worth skipping.